The Bury Times is reporting today that the cabinet of Bury’s Labour-controlled council met last night to rubber stamp a £10 million pound loan, to be repaid over forty years. The money will be used to fix potholes and resurface roads across the borough. 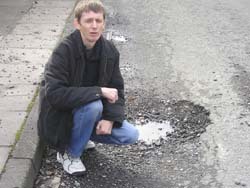 Regular readers of my blog will know I have written often about the state of our roads (mainly those in Unsworth and Whitefield granted) and a quick look through my ‘roads’ archive here show that the problem is extensive. Our roads are a real mess and have been for some time. These are shocking statistics. The same Bury Times article also states ‘it is intended borrowing costs would be funded through reduced patching costs and fewer insurance claims.’ I counter-claim that this suggestion is nothing more than pie-in-the-sky economics and is not backed up by a sound business case. Lastly, and most worrying from a budget point of view, the council has said that initial borrowing costs would be paid for out of the council’s reserves, to a total of £611,000. But what about the ongoing costs? This is another example of Bury’s Labour party mismanaging our roads and mismanaging the borough’s finances. £10m will provide a superficial patching at best (which will soon break down) however every single council tax payer in Bury will have to pay for this ‘quick fix’ for the next four decades. What do you think? Let me know by commenting below.